Thanks to participants who have joined our new Volunteer Research Group for The Orange Lilies – Brighton and Hove in the Somme WWI focussed project. This was the first session and took place at Jubilee library with the support of the Brighton and Hove Libraries and Information Service. This was also the first opportunity for everyone to meet each other and the new Research group Coordinator Ross Hammond. 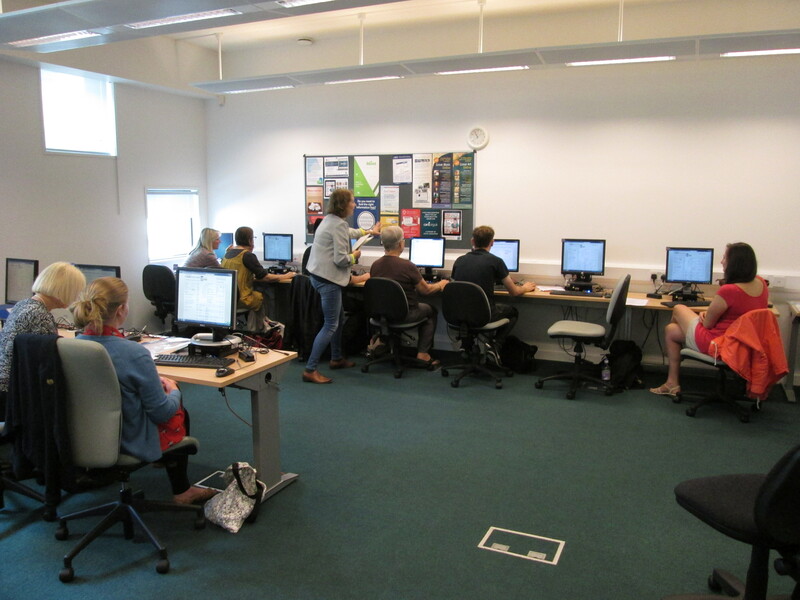 We will be having an Ancestry.co.uk genealogy training session at Jubilee library in the first week of September (Date TBC) to boost skills and development. Following this, the research group to The Keep archive on Thursday 6th October 11am-4pm to explore artefacts and photos of Brighton and Hove lives during 1916. This is a free event and you will gain new research skills with the support of our Research Coordinator Ross Hammond. We had a lovely time at our WWI themed Conversation Cafes yesterday, meeting at Jubilee Library, Brighton with speaker Cuthbert Williams MBE, Chair of the organisation Brighton Black History, sharing stories of the BME community in the city during the Great War. Many thanks to him for taking time to come and meet our group and to Jubilee Library for hosting us for the session. Our free WWI reminiscence CONVERSATION CAFÉS continue next month, taking place on the second Wednesday of every month. The next session is on Wednesday 9th December at Hove Library with Margaret Curson of the Rare Books Archive from 2.30-4.30pm. All welcome! This is part of our project, The Boys on the Plaque: Unearthing Hidden Histories of WWI Soldiers from Brighton & Hove. For those interested in finding out more about this project and these themes from WWI in the city of Brighton – join our Conversation Cafes for reminiscence activities, outings and events. We’ve just received this moving piece from a project we are involved with The Boys on the Plaque – Ross Hammond who is coordinating a research group at Fabrica looking at those who served or fell in WWI. Names written on a memorial plaque residing inside Fabrica gallery are being researched and uncovered for posterity. Ross says: On this thoughtful day I would like to share with you one story that we have discovered over the few months that project has been running. I would also like to think of all the fallen on our Plaque, from the First World War and all conflicts before and after. The following words and research are by James Gasston, a Volunteer Researcher on the Boys on the Plaque Project. 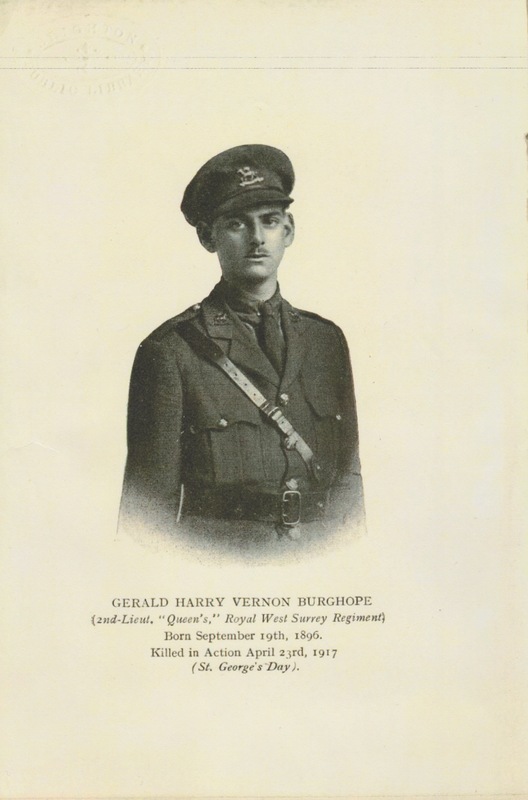 Gerald Harry Vernon Burghope was born in Brighton on September 19th 1896, to Harry and Ethel Burghope of 6 Highcroft Villas. The oldest of three children, he had two sisters; Gwendolyn was born in 1899 but died before her first birthday, and Audrey was born in 1904. His Father and his uncle John owned Burghope and Burghope, a tailors and outfitters at 139-140 North Street (now Barclays bank). Gerald joined the 19th Royal Fusiliers as a private, before transferring to the 1st battalion of the Queen’s Royal West Surrey Regiment. He was made a temporary 2nd Lieutenant on the 5th of August 1916. A little over eight months later, on the 23rd of April 1917, he was killed in action in France, where his body remains. He is commemorated on the Arras memorial at Fauborg-D’amiens cemetery, and at the family burial plot in St Martin churchyard in Westmeston, just outside of Lewes. I gleaned that information from various online genealogical resources, but none of it really told me anything about who Gerald was. It wasn’t until we visited The Keep, which houses hundreds of years worth of records relating to East Sussex, that I felt I gained some insight into that. He was a keen poet, and The Keep holds a book of his poetry, published after his death in 1917. 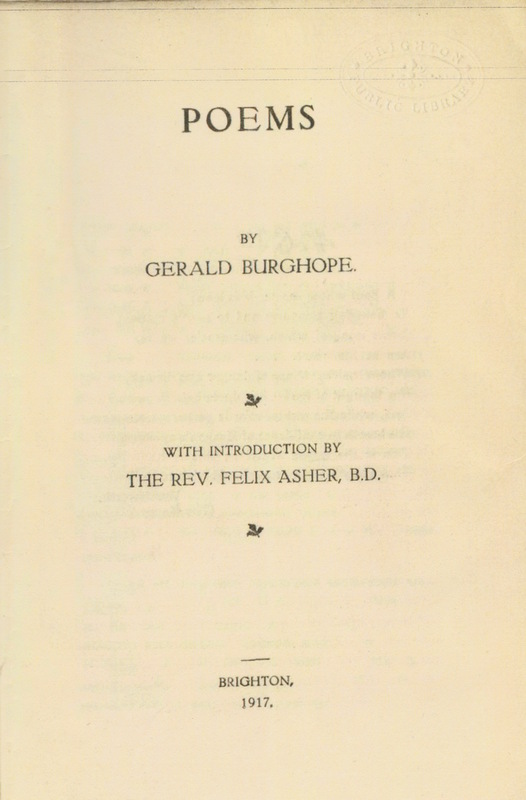 On the second page is a photograph of Gerald in his army uniform, and the introduction is written by the Reverend Felix Asher, who was incumbent at the Holy Trinity Church at the time and a friend of the Burghope family. A year after this was written, on the 13th of May 1917, Gerald’s memorial service was held at Holy Trinity Church, led by Reverend Asher. Conversation Cafe’s taking place this month at Jubilee and Hove Library – Run by Strike A Light. The Boys on the Plaque Conversation Cafe’s will discover, collate and share objects, photographs and documents to tell Brighton & Hove’s personal and community history during World War 1. Session Two this month takes place at Jubilee Library and is joined by Cuthbert Williams MBE from Brighton Black History for an informal discussion about Indian soldiers at the Royal Pavilion. A God in every Stone – WWI novel accompanying Conversation Cafes. We hosted a really lovely session today with our new Conversation Cafe group at Fabrica gallery and the Friends Meeting House in Brighton. Reminiscence activities, new WWI novels, an update from the Boys on the Plaque research group co-ordinator Ross Hammond, a talk about our WWI memorial plaque, plus tea and biscuits. We’ve been loaned copies of the WWI novel ‘A God in every Stone’ by Kamila Sharmsie from Brighton and Hove Library service, thanks to them for this. We will be reading this in tandem with sessions up to Christmas. See you for our next session on Wednesday 11th November! Our free WWI CONVERSATION CAFÉS start tomorrow Wednesday 21st October. Why don’t you try them out! They will then take place on the second Wednesday of every month at Fabrica gallery and other Brighton venues from 2.30-4.30pm.